Credit: U.S. Dept. of Agriculture. This is some very welcome news from our friends at the Angeles National Forest, which covers much of the San Gabriel Mountains. 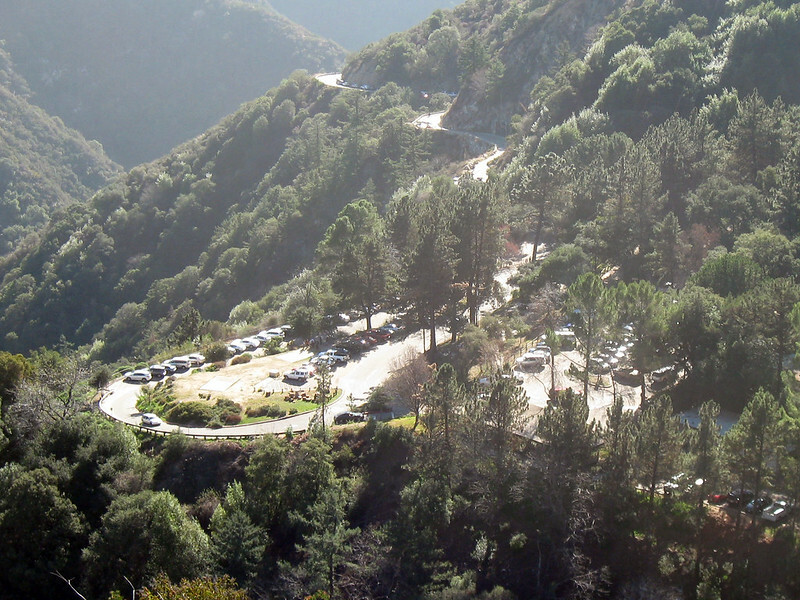 Chantry Flat is an extremely popular picnic area and trailhead above Arcadia. It also has a small parking lot that fills up early on weekends, requiring motorists to either circle endlessly or park in tiny pullouts way down the road. Chantry Flat is probably best known as the jumping off point for the 1.5-mile-or-so hike to Sturtevant Falls, shown above. After an initial descent on a road, the trail follows Santa Anita Creek upstream past private cabins to the falls, which in winter and spring can be pretty impressive. There are also several other trails that run from Chantry into the surrounding mountains. My advice: pick up the Tom Harrison ‘Angeles Front Country‘ map, either online or at the REI store next door to the Gold Line’s Arcadia Station. 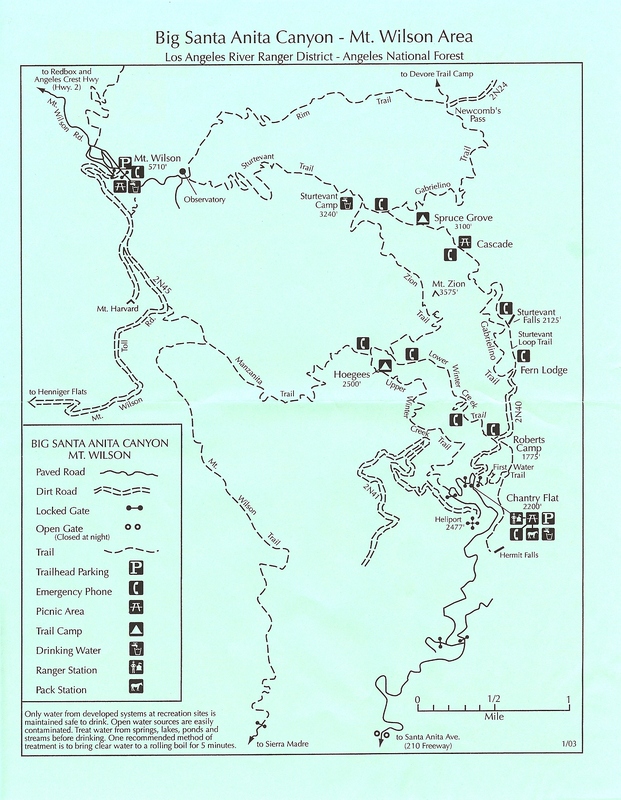 Below is a Forest Service map from an Angeles N.F. 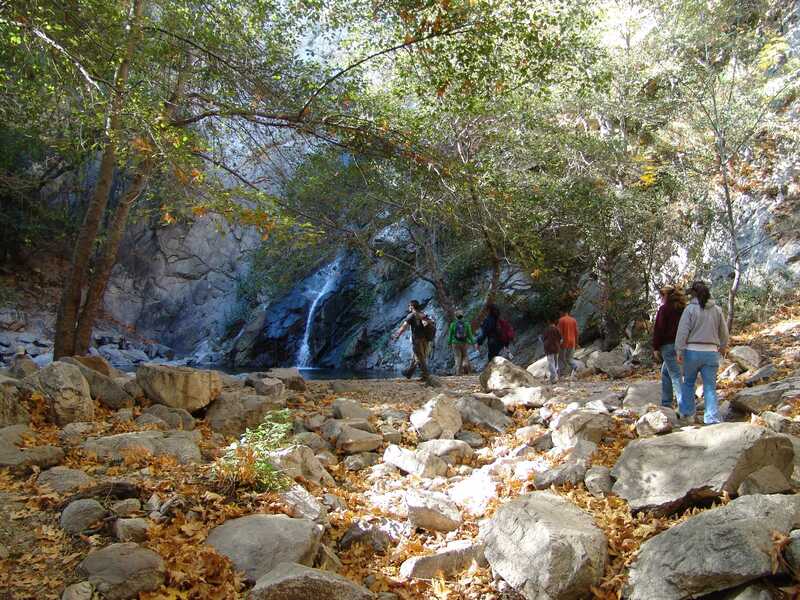 flyer and here are posts on Modern Hiker about hiking to Sturtevant Falls and a longer trek on the Winter Creek Trail — beware that getting to Mt. Wilson and back during the shuttle’s hours would be extremely difficult. But there’s still time to see some of that trail. 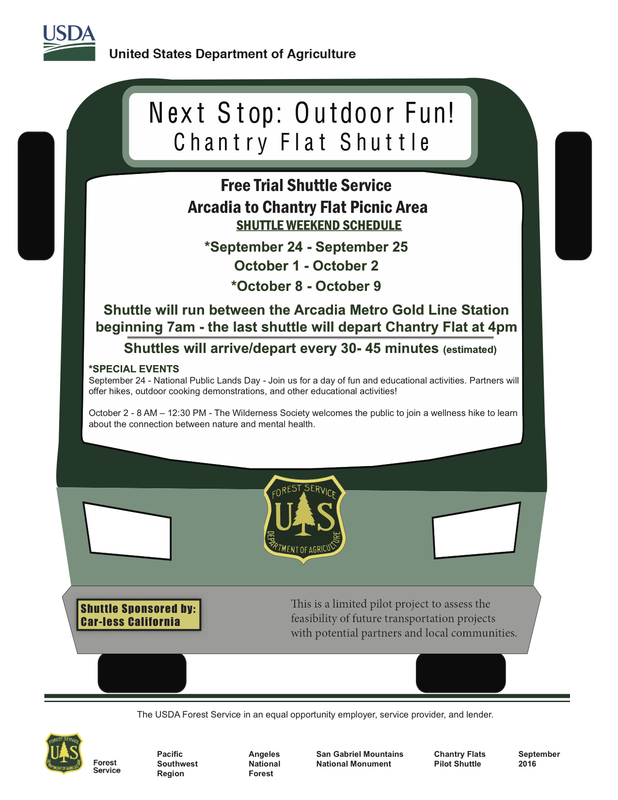 The other great thing about the shuttle is it solves one of the more vexing issues we have transit-wise in So Cal: we have tons of open space and hundreds of miles of local trails, yet they are often inaccessible by transit or inconvenient to reach. This is just a test program, but hopefully it will go well and the service will be funded into the future. Thanks Steve. Will definitely take my son to see the falls this Saturday. They need to do a better job than every 30 -45 minutes, though. That is a wide range that means that people could be standing in the sun to wait for a bus for a long time. Just because people aren’t headed to work doesn’t mean that they don’t need to get somewhere within a reasonable amount of time. Either print a schedule (even with estimated times) or create some sort of real time tracking so that you know where the bus is. People are clueless and are ruining this trail with their trash and not respecting nature…. One thing they are doing is educating the “clueless” a tv on the shuttle will play a video educating riders about fire safety and leave not trace principles.